Q. How do I find out what room my class is in? You can find your classroom location under your Class Schedule in the Student Self Service section on Engage. Log into Engage and click on the Self Service tile in the navigation bar. In the new window, you will see a section labeled Academics. In this section click on My Academics. On the My Academics page, look under Enrollment in left sidebar. Under Enrollment is a link to Class Schedule. Click on Class Schedule to see your current courses, schedule, and classroom locations. 1. Log into Engage and click on the Student Self-Service tile. 2. Enter your Berkeley user name and password to access Self Service. 3. On the main Student Center page, click on My Academics on the left side. 4. 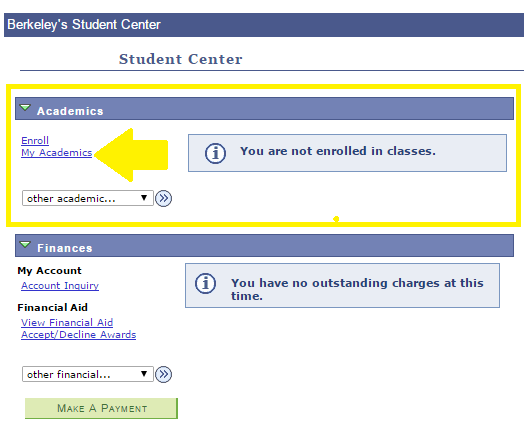 On the My Academics page, look under Enrollment in left sidebar. 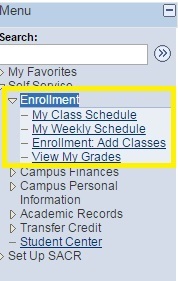 Under Enrollment is a link to Class Schedule. 5. Click on Class Schedule to see your current courses, schedule, and classroom locations.